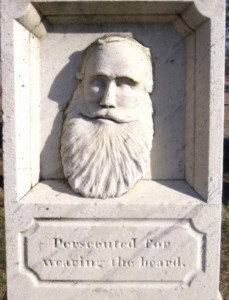 In a graveyard in Leominster, Massachusetts you can find the grave of the infamously bearded Joseph Palmer. In the 1820s, Joseph had started sporting a very large beard even though he knew that beards were seen as out of style and a man that wore one was seen as dirty and unkempt. He was ostracized for his facial hair and was even accused of consorting with the devil because he sported such a long beard.